I grew up thinking of money as a means to procure the things that brought immediate satisfaction. As soon as I had it, I used it, and I felt fine doing so. I never lacked the necessities, and so I figured I had all that I needed. There comes a time in many of our lives when a single event changes everything, and for my family it happened on an icy February Saturday. My wife, who had recently decided to buy some sneakers as the impetus to begin a more movement-oriented lifestyle, went out for a walk. She called me three minutes later sounding disoriented, but she assured me she was fine. I knew, from the sound of her voice, that she wasn’t. She had fallen on a patch of ice, and had gone from standing tall to hitting her head on the hard ground with enough velocity to render her unconscious. When she came to, the events of the preceding few moments were lost to her, and she had a tenuous grasp on reality. She was told by the doctor who diagnosed her concussion to avoid screens, reading, and excessive thinking for at least a month, maybe more. This is no small task for the least intellectually savvy of us, let alone a star mental health professional who had earned the respect and admiration of the highest echelons of the hospital at which she worked. Devastated but determined, she begrudgingly took to her bed rest, and eventually found solace in podcasts. She always had frugal tendencies, and she found her way to a podcast called The Mad Fientist. At first I wrote off the dense numerical tone, but when it was explained to me that I didn’t have to resign myself to a career to which I was rapidly becoming less and less attached, my interest was piqued. Once I dove down the rabbit hole with her, our journey to FI began in earnest. It’s been two years since that fateful day, and from the ashes of abrupt change we have risen as a team, steely-eyed and strong in our joint determination. As we got together to formulate how we would proceed, the most obvious starting point was to cut whatever expenses we deemed frivolous. The cable TV was the first to go, followed by my membership to a climbing gym for which I no longer was able to find time to visit. Our expenses never really was out of control, so it was fairly simple to tie up the loose ends. The most important aspect of that for us was just setting ourselves up with a Personal Capital account so we could keep a close eye on where our money was actually going. I feel like it is important to mention at this point that there are some things that we decided were justified expenses, in that the pleasure we derived from them made their existence in our lives worth the cost. The biggest example here is our hot tub. We live in New England, and the winters here have a tendency to be long, dark, and very cold. Having a hot tub, while expensive to maintain, brings us a great deal of joy during the winter months. I want to make that point because, like so many others in the FI community at some point on their journey, I let my enthusiasm carry me a little too far, to the point of deprivation. There is a difference between frugality for a cause and cheapness for the sake of being cheap, and I am guilty of a momentary lapse. The next logical step, once we minimized and monitored our spending, was to work on directing our savings. We did this by finding and utilizing any pre-tax buckets we had available. This is where working for the state comes in handy. Because I work as an electrician at a university, I have access to both a 403(b) and a 457. The difference between these, if I may offer a brief overview, is that the money in the 457 can be accessed without penalty upon severance of employment. In other words, as soon as I leave my position with the state I have access to that account, regardless of my age. The 403(b) is akin to a 401(k), but it is the version used by non-profit entities. My wife has access to a 403(b) as well through her employer, and we managed to max out her 403(b) and my 457, while still adding a small amount to my 403(b). We also created Roth IRAs, along with a brokerage account. The sense of satisfaction at seeing these numbers grow has been incredibly inspiring, and continues to solidify both our motivation and our relationship. We put a lot of time and effort into studying rental real estate markets, both in and out of state. A few units producing monthly cash flow would really bump up our income, while hopefully not sucking away too much of our valuable time. Okay, that was pretty cheesy, but it’s true! We’ve been looking at ways to make more money besides real estate, and that means the all-important side hustle. For me, having a side job is pretty simple: as soon as people find out I’m an electrician, they inevitably want me to go work at their house because they can’t get an electrician to call them back. All I had to do, and I had done this even before I knew about FI, was get a Doing Business As (DBA) certificate from my town hall, and get an insurance policy, and my business was off and running. My wife, as a social worker, had a slightly less clear-cut side job opportunity, but she found her calling by opening a private practice as a therapist. She had to find an office space (some therapists choose to work out of their homes, but my wife was uncomfortable with this idea), and she also went through the DBA and insurance steps. Her business has flourished, and both of us find ourselves routinely turning down work due to lack of time. This journey, though it stemmed from a place of pain and strife, has proven to be one of the most fruitful and enjoyable aspects of our adult lives together. Not only have we seen a huge improvement on our bottom line, we’ve given ourselves the power to live mindfully and intentionally. We’ve also made it a mission of ours to educate our children, both through conversation and by example, the importance of financial literacy. Too see them weigh cost versus enjoyment when considering a purchase has renewed our sense of purpose, and lets us know they are going to be just fine as they grow older. We still have a long way to go, but we have discovered that the end goal is but a minuscule aspect of the mindset as a whole, and the journey itself has become our muse. We’ve strengthened our relationship through our resolve, and we celebrate each win together. It was a dark month that spurred this change, but the light has been shining ever brighter since that day. As we move into our new future, we have high hopes for the upcoming months and years. Our perspective toward FI has shifted over the years and will continue to do so, but the core principle has remained the same: live purposefully and mindfully, be grateful for what we have, and look to the future with optimistic realism. The community we’ve discovered and the friendships we’ve made through blogging, CampFI, and podcasts, have enriched our lives, and we love introducing this new world to those around us. We will always work toward growing our knowledge and strength, and seek to be open to any opportunities that may present themselves. Each day is a new adventure, and it all came from a fall on the ice. Such a great story. FIRE and Ice. Glad we met at CampFI. I love this! I often tell clients that early on, we often times overcorrect. This isn’t the goal, of course, but when we feel both extremes, it’s actually easier to find the middle ground/the balance. There were so many takeaways from your journey Tinian. Oh heck, let me go ahead and just copy your entire journey here as a big takeaway! I’m so happy for you and your family!! Keep up the good work! I love that you used a life changing experience to change your life! Often times people who esperience life changing moments fall back into the routine they were in prior to the experience. I look at it kind of like going on a mission trip. When you get back you are all fired up and ready to change the world until a few months pass by and you are caught back up in the American way of living. 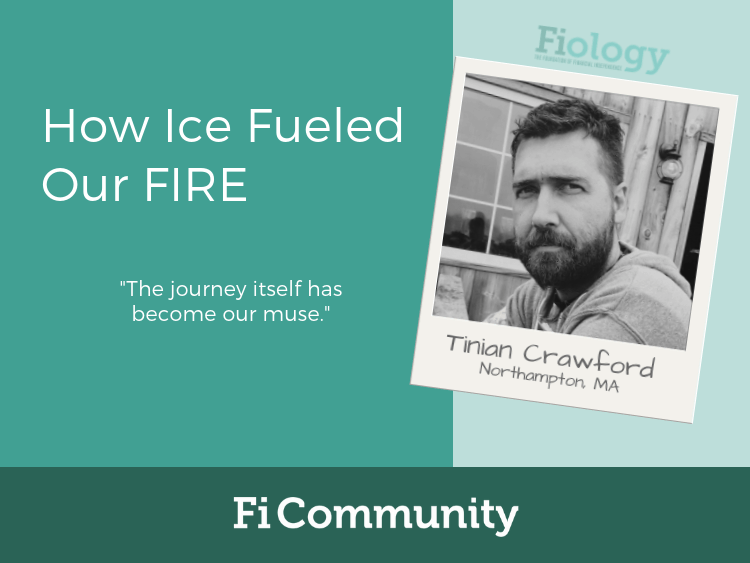 Thank you for sharing your story with others and continue fueling your fire journey with your story of the life changing moment on ice.